In her recent interview on the Mike Malloy Show – the former FBI translator, Sibel Deniz Edmonds (b.1970), who was fired for her objections to some secret dirty work being carried out by the Zionist Administration in the name of US citizens – reveals that the successive Zionist Aministrations under Clinton and Bush have kept intimate relations with Osama Bin Laden until September 11, 2001. Sibel Deniz Edmonds also believes that there is a close relation between Turkish Jewish Deep State and American neocon Jewish Deep State. She has accused several Pentagon officials working as “mole” for Israel and Turkey….. Lawrence Franklin (a former Pentagon analyst, who was jailed in 2006 for passing US defence information to Israel Lobby and sharing classified information with the Israeli diplomat) was “one of the top people providing information and packages during 2000 and 2001 (Chris Gourlay in TimesOnline, January 6, 2008)”. Sibel’s testimony to the 9/11 Commission has entirely been suppressed as she explained in her article titled open letter to the 9/11 panel (Anti-War com, August 2, 2004). Last year, Leslie Hughes, a veteran journalist from Winnepeg, was honored with the “anti-Semite” title by the Canadian Jewish Congress (CJC) for her article written in 2003, Get the Truth, claiming that since Israeli government owned Zim shipping company broke its lease and moved its 200 employees from WTC just one week before 9/11 – proved that Israel had foreknowledge of 9/11. Liberal Party leader Stephane Dion refused to issue party ticket to Leslie for the election. Sibel’s father, Dr. Rasim Deniz (d. 2000), was born in Tebriz (Iran). He spoke in Persian, Turkish and Azerbaijani – the native languages of the part of Iran. He was head of Burn Centre in Tehran’s central hospital. Dr. Deniz was a frequent target of Shah’s secret police SAVAK for his secular and anti-government views. After Islamic Revolution (1979), the family fearing the strict religious agenda of Revolutionary Guards – it fled to Turkey. Sibel got her Bachelor’s degree at George Washington University in criminal justice and psychology. In 1992, she married Matthew Edmonds, a divorced retail-technology consultant. After September 11, 2001 – she was the first Turkish language translator hired by FBI. Her job was to listen to the wire-taped intelligence information which comes in foreign languages – filter them and decide which one is important (“pertinent” in FBI terms). 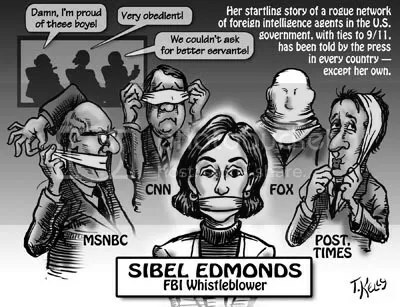 After being fired – Sibel did what other earlier whistleblowers (Mike German, John Cole, etc.) had done – she appealed to the Congress. Later Attorney General John Ashcroft tried to wipe out Edmond’s legal action by invoking the state secrets privilege. Sibel’s lawyer has filed a US$10 million suit citing threat to Edmonds’ family, unable to look after her real-state and business interests in Turkey and her vilification in Turkish press. The video above is no longer available on youtube.